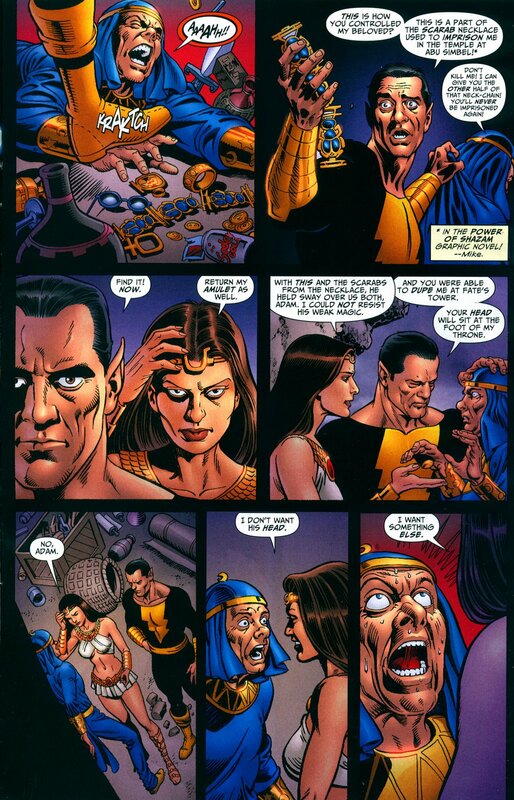 Comics In 5 Panels: Johns Month(and a half): Black Adam And Isis. Black Adam is NOT evil. I just want to be sure that you all understand that. Black Adam is, in fact, not evil. He is brutal, has little to no tolerance for evil, and has no problem with killing. Does that make him a bad guy? No, it makes him a very angry man out of time. Think about it this way: in ancient Egypt, he was a great hero. Back then, the view of killing was different. The laws and culture was harsh, and you could be punished with loosing a hand, if you were caught pickpocketing. So the way Adam was raised, and the world he lived in 3000 years ago was WAY different from today's modern society. There is so much you can do with a character like Black Adam. But instead, DC turned him into a evil meanie beanie. And the prime example of this is the JSA story-line; "Black Adam And Isis." Atom Smasher(former JSA member) tells the JSA, that Black Adam is back, and offer them his assistance in bringing him to authorities for crimes during World War 3(the only thing wrong with pretty awesome series; "52"). And Black Adam IS back, and he has resurrected his dead wife Isis. Isis is a human with the power of her namesake, the Egyptian goddess. You see, she had suffered a horrible dead, right after seeing her brother being ripped apart, and her country being destroyed. So naturally, she is pretty pissed. And by pissed, I mean destroy-the-world pissed! And the worst part of it all; it's all blamed on Black Adam. Everyone has this bogus theory, that it is because Isis is corrupted by Adam that she went psycho-killer. This is bullcrap, since she is doesn't share her power with Adam like like Captain Marvel Junior share his power with Captain Marvel. Isis is a freaking god! And she is WAY more powerful than Adam, who only has been bestowed powers by the gods. AND, just to make maters worse, the same explanation is being used in order to explain why Mary Marvel became evil in "Final Crisis." This is not only bullcrap, it's also unnecessary, since it was already explained, that it was Deaad, evil torture of Apokolips. So it was, in fact, NOT Black Adam's fault. But hey, that's what we have retcon for. In fact, retcon is one of the biggest problems with this story. And that's REALLY weird, since Johns has a reputation for writing stories that are pretty loyal to the history of the DCU. But here, he retcons the hell out of it! He even makes Adam the murderer of Billy Battson's parents! THAT'S how it ends? That's... depressing! The story ends when Adam realizes that his wife is out of control, and gives up his powers, so that the wizard Shazam can be reviewed(I don't know that that works) and take away his crazy wife's powers. But Shazam is still peeved, so he also turn Adam and Isis into statues, and tells Billy that he is a stupid brat and that he wont let him be Captain Marvel again. A lot of people believes that internet critics are dorks who has nothing better to do than complain about meaningless stuff, because they don't have a girlfriend. That is not true. The reason we write blogs(or make videos) about how pissed off we are about a video-game, movie or, in this case, a comic-book, is because of passion. I love comic-books, Geoff Johns is one of my favorite writers, and I'm a fan of the DCU. These are the reasons to why I hate this story! Black Adam's character is ill-treated, the retcons was unnecessary, and the fact that we have to be reminded at least ones every page that all of this is Black Adam's fault is just irritating. I think of this as Johns' "Cry For Justice." And I think that it was here the quality of his stories started to drop a bit, and that he also started to use retcon more. Man, this sucked. Next time, let's talk about a GOOD JSA comic.